ALL THE THINGS PLUS A $50 AMEX GIFT CARD. Where are you now? In your kitchen? Look around, are there grass clippings on the floor even though your swept 5 minutes ago? Have three children dirtied 23 cups and glasses today? Is half the neighborhood in your living room or backyard? That's nothing. Summer's real parent gut punch isn't the giggly chaos of feral children on school break, it's the cost of actually living with your children. During the school year, when big kids head to the bus stop and little kids get carpooled to preschool, you aren't really living with your kids so much as running a hostel. A hostel, but instead of a smattering of UN-representative co-eds who don't shower often, it's just your own dirty kids in the mornings, afternoons and weekends. When summer hits, it's no longer you and the baby waving bye-bye to big sissy. Remember that? It was only a few short weeks ago that you'd bundle off your older children and you and the baby would head to Target to unwind. Now, not only is your house crawling with short people, you can't afford a Target run. Summer the time of year when the kiddos come home to roost, and it's the time of year when you may as well set your money on fire using a magnifying glass and the unrelenting rays of the sun. For three seasons out of the year, you have a typical family budget. You spend on groceries and crayons and 27 pairs of gloves and new shoes for that one kid of yours with the abnormally fast-growing feet. But the summer budget is bananas. Not a euphemism, bananas are an actual purchase category along with watermelon and sweet corn and the other fruits and veggies that are in season. By the time the end of August is here, you'll be seriously considering a second mortgage just so you can buy school supplies. Unless you you've been smart enough to put your baby in Luvs. Not only because Luvs* keep a baby dry (with large stretch tabs, ultra-leakage protection, and a money-back guarantee), but they do it for less cash than other brands. And you need that cash to buy the baby sun hats that she'll keep ripping off and tossing in the pool while you stand there pushing her around in an inflatable floating unicorn. The first point is summer is expensive, but your diapers don't have to be. Not only are Luvs affordable when they aren't on sale, this coupon for $2 off via Coupons.com and this Ibotta rebate (download the app on iOS or Android and search for Luvs to unlock the rebate) for $3 off any box of Luvs that's 54-count or larger, make them an even better deal. Now you have money leftover to spend on new beach towels, which you need because last year's towels smell funny. So go save here and here or here. 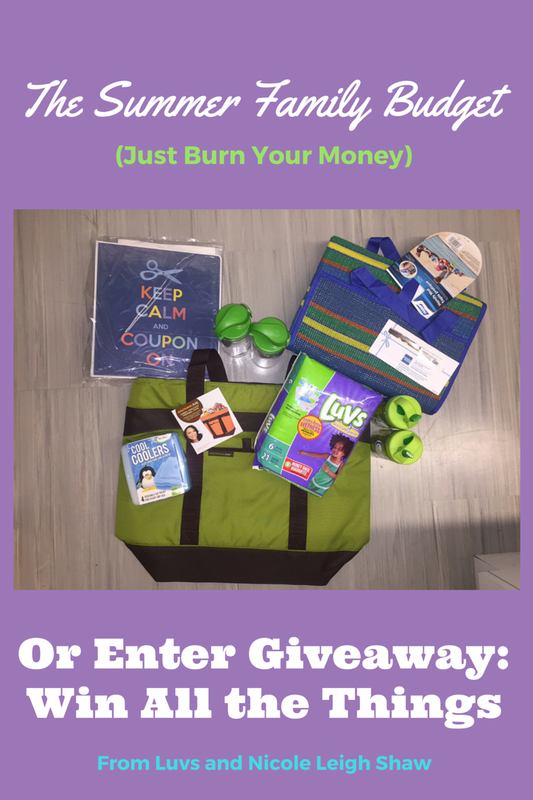 Go enter the giveaway via the Rafflecopter down there. And go take your summer cash flow back. 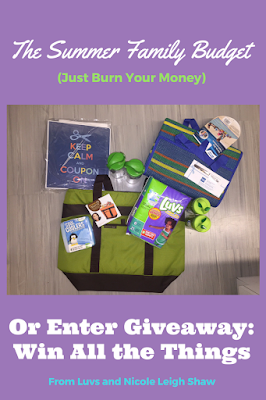 * Luvs is sponsoring this post, by the way, and not just because they like me, but because I was a Luvs mom when my kids were in diapers and I know they work and are affordable. 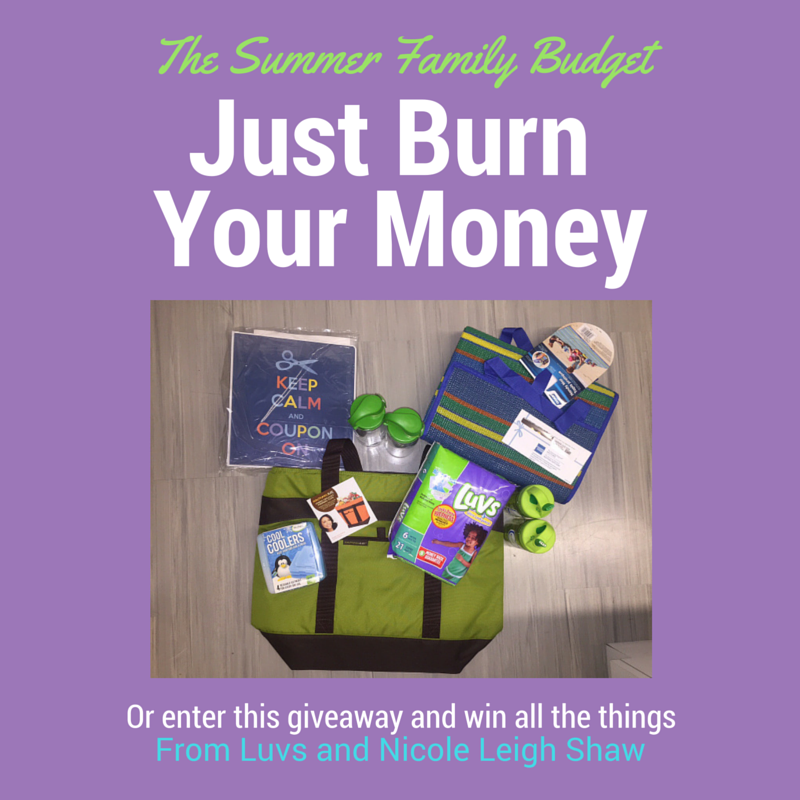 So, compensation by Luvs, humor and opinions by Nicole Leigh Shaw. Also, this disclaimer: Luvs has only provided me with the product that I am using as the prizes for this giveaway. By entering the following giveaway you are accepting that, if you win, your contact information will be shared with a Luvs PR and shipping agency for the purpose of mailing your prize. Please allow 4-6 weeks from the contest closure date to receive your prize.